This authentic Boston jersey from 1908 resides in the collection of the Baseball Hall of Fame. The grey flannel road jersey with a red emblem was worn for the first time by the newly named "Red Sox" at spring training in 1908. The Sotheby’s lot description added that the Gothic letters, “B” and “A” were affixed on the right and left breast of the shirt. Accompanying the auction catalogue write-up was a photo illustrating that the “BA” emblem on the jersey was red. Sotheby’s was correct in calling it a “Boston Americans” jersey because the franchise did not become the “Red Sox” until owner John I. Taylor made that decision in late 1907. On December 19, 1907, a Boston Globe headline read: “TO BE KNOWN AS RED SOX; PRES TAYLOR SUGGESTS A NAME; UNIFORMS ORDERED…” From the time of the teams inception in 1901, the Boston Americans official team color was blue, as indicated in Mark Okkonen’s uniform compendium Baseball Uniforms of the 20th Century. Taylor’s decision, published in the Globe, caused quite a stir as it was the first time his club would be wearing “red stockings” like the original National League teams in Boston dating back to 1876. Okkonen’s research determined that during the 1907 season Boston’s National League club, at the behest of their new owner George Dovey, discarded their traditional reds and wore a home uniform with a maroon “B” on the chest and a road uniform featuring an Old English “B” in blue, with fine green pin-striping. Okkonen concluded that the Boston Americans, “seized the opportunity to use RED in their uniform designs for 1908 since no other American League club was so identified.” (In 1908, Dovey returned to red uniforms). The research of Mark Okkonen first verified that the Boston American League club wore blue before their introduction as the "Red Sox" in 1908. This page from his 1991 book, "Baseball Uniforms of the 20th Century" illustrates what the Boston uniforms looked like from 1901 to 1907. This would all be fine in regard to the Jimmy Collins jersey sold at Sotheby’s for $26,450, but for one reason: Boston traded Jimmy Collins to Philadelphia on June 7, 1907. That was six months before Boston even became the “Red Sox” and ordered their new red uniforms from Wright & Ditson. It’s impossible for Collins to have worn a red-themed Boston Americans uniform and even if the Boston club ordered a red ”BA” style uniform for 1908, it would also be impossible for there to be a surviving example attributed to Jimmy Collins. It’s yet more proof supporting the conclusion that the Collins jersey is another elaborate forgery from the Barry Halper collection. 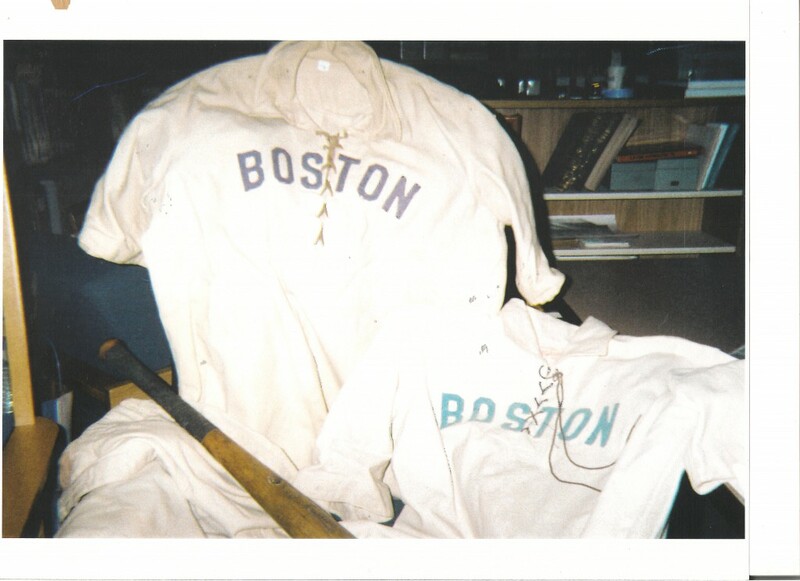 Mark Okkonen's findings are supported by the existence of these two authentic Boston American jerseys from 1903 and 1904. They belonged to "Candy" LaChance, who contributed them to a New England museum while he was still living. The B-O-S-T-O-N lettering is the traditional blue used by the club from 1901 to 1907. 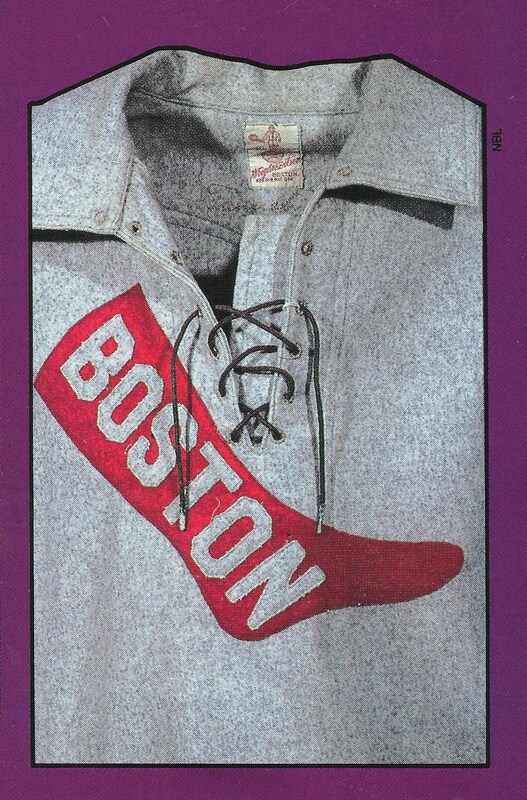 Examination of Halper’s alleged 1907 Collins jersey suggests it was a period garment that was altered to add the Boston insignia and maker labels, sometime in the 1980s. (Halper’s alleged Cy Young jersey with the same red “BA” insignia appeared in a 1985 Sporting News feature story by Bill Madden.) It appears that the forger was unaware of the fact that the Boston team wore only blue through 1907. The basis for the forgery could have been tobacco and candy cards created between 1908 and 1911, which illustrate the “BA” style of Boston uniform in red. The artists for the card manufacturers colored Carl Horner studio photographs originally shot between 1902 and 1906, when the uniforms were blue. 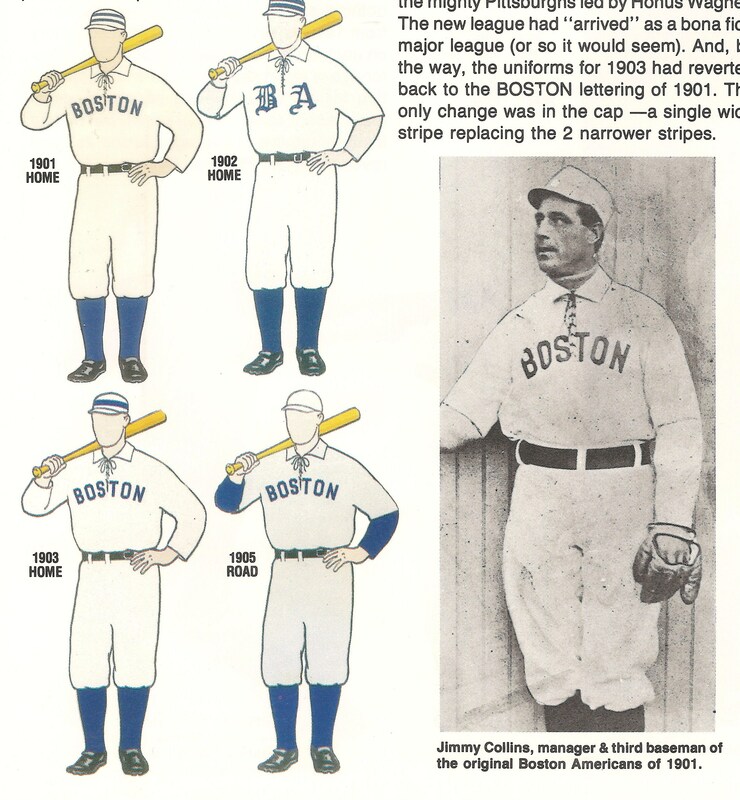 By the time the cards were produced the Boston Americans had already become the “Red Sox,” thus we see the red “BA” insignia on the cards, just like the one on the bogus Jimmy Collins jersey sold by Sotheby’s. The forger of the Collins jersey was likely familiar with this E-90-1 card of Cy Young from 1909. 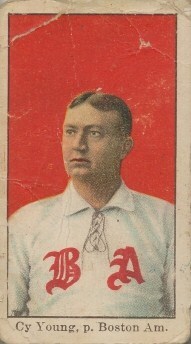 The card is based on a 1902 Carl Horner photo when Young wore a blue "BA." Boston was wearing red at the time the artist colored the image. 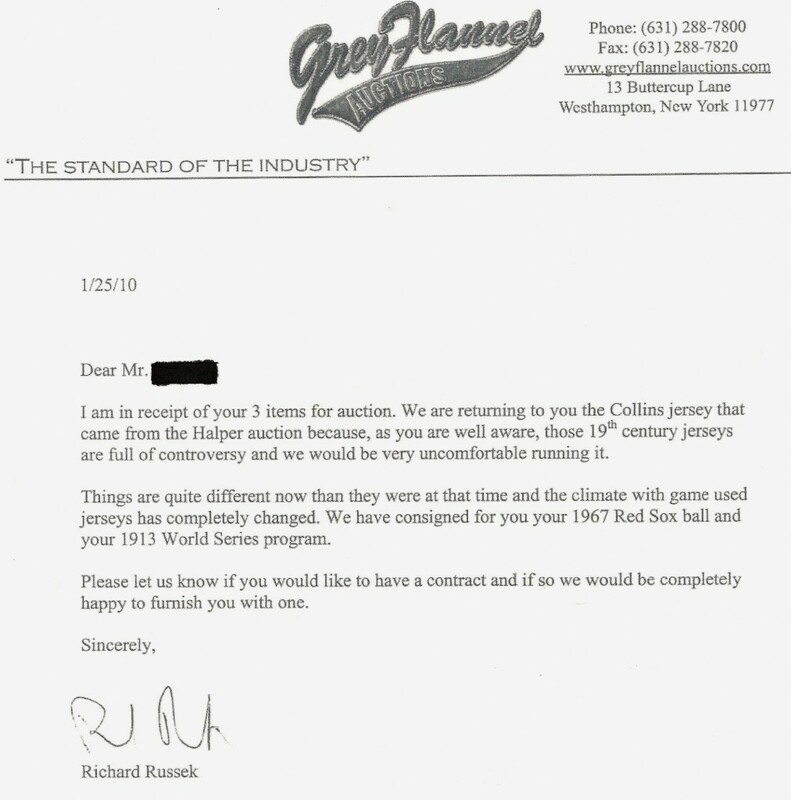 Back in 2009, the purchaser of the Collins jersey contacted Rob Lifson, president of Robert Edward Auctions, and expressed interest in consigning the jersey to one of Lifson’s auctions. Lifson, Sotheby’s head consultant for the Halper Auction in 1999, then told the owner that any uniforms included in his sales had to be approved by the authentication company MEARS of South Milwaukee, Wisconsin. So, the owner of Halper’s Jimmy Collins jersey submitted it to MEARS and the garment was thoroughly examined by uniform expert Dave Grob. Grob’s report indicated a host of problems with the Collins jersey ranging from irregularities in the construction, alignment and placement of the Gothic “BA” lettering, as well as significant evidence that the Wright & Ditson manufacturers tagging on the jersey was not original to the garment and had likely been added at a later time. Grob’s final analysis in June of 2009 was that he could not authenticate the jersey and his report was made available on the MEARS website. Later, in 2010, after learning about a similar Halper jersey attributed to Cy Young, Grob wrote an article for Haulsofshame.com, stating his belief that both jerseys were likely forgeries. 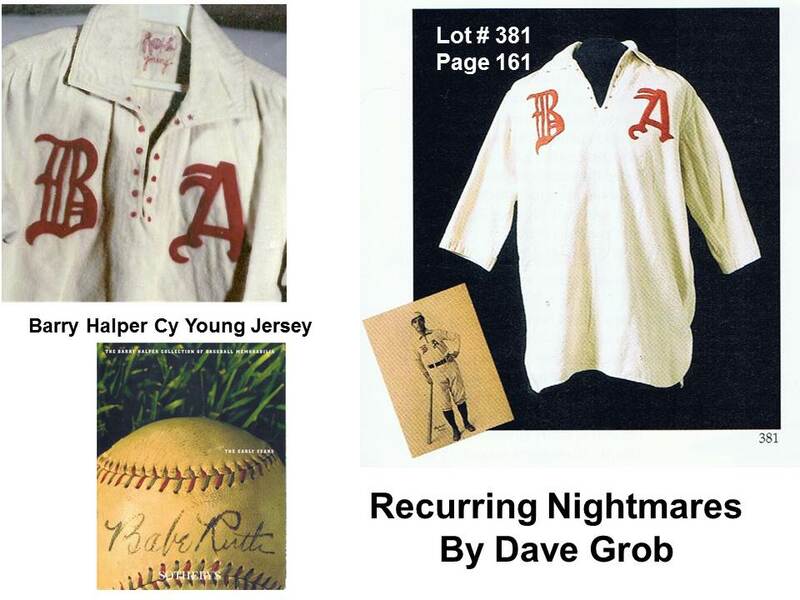 Dave Grob wrote an article, "Recurring Nightmares" about his experience authenticating Halper's Jimmy Collins jersey and examining photographs of Halper's similar Cy Young jersey. He concluded that, based on similarities and commonality of irregularities, both jerseys may have been constructed by the same person. The owner of the Collins jersey, who furnished a copy of the Grey Flannel letter to us providing we would not reveal his identity, was astonished. The authenticator who originally certified his jersey for sale at Sotheby’s had now rejected it, citing “controversy” regarding the Halper uniform collection. Despite Russek’s assertion, Grey Flannel was still promoting their work for Sotheby’s on their company website and still claimed that Halper’s collection “rivaled that of the Baseball Hall of Fame.” The same Hall of Fame that accepted Halper fakes from ”Shoeless Joe” Jackson, Mickey Mantle and possibly others. In addition, the buyer also confirmed that, although Sotheby’s stated in the catalogue that Grey Flannel authenticated all of the Halper uniforms in their sale, he never received with his purchase, an actual letter from Grey Flannel documenting their work. Auction houses refer to such documents as “Letters of Authenticity” (LOA’s) and include them with lots as documentation for the buyer and for future sales of the item. In a July 23, 1993 article that appeared in Sports Collectors Digest, writer Dan Schlossberg quoted Barry Halper, who claimed that he was the first to coin the phrase “Letter of Authenticity” in the hobby. But since the Halper sale in 1999, many of the alleged “authentic” jerseys sold by Sotheby’s, and approved by Grey Flannel, have also been deemed forgeries by experts. Hundreds of thousands of dollars worth of jerseys are now virtually worthless, including examples from Baseball Hall of Famers like, Wilbert Robinson, Hugie Jennings, Buck Ewing, “Iron Man” McGinnity, John McGraw and even more modern duds from stars like Reggie Jackson. Other 19th century jerseys Halper had boasted of owning, but did not appear in the Halper sale at Sotheby’s, have mysteriously vanished from the hobby. The whereabouts of alleged jerseys of Hall of Famers “Pud Galvin,” “Old Hoss” Radbourn, John Clarkson, “Wee Willie” Keeler” and a host others are unknown, although Sports Collectors Digest reported in 1998 that the Radbourn and Clarkson jerseys were donated to Cooperstown by Major League Baseball. Grey Flannel sent this letter to the Sotheby's winner, rejecting the Jimmy Collins jersey for their own auction. Although they had authenticated the jersey for Sotheby's in 1999, they told the owner his jersey and others from the Halper Collection were "full of controversy." We contacted Richard Russek, president of Grey Flannel, for an explanation of the “controversy” indicated in his letter, as well as his company’s rejection of the jersey they originally authenticated for Sotheby’s, but Russek declined comment. In 1999, Grey Flannel was retained by Sotheby’s and their lead consultant, Rob Lifson, president of Robert Edward Auctions. Lifson was a long-time Halper friend and associate , and the hand picked consultant chosen by Sotheby’s and Halper to oversee the entire Halper auction. Lifson’s auction house was using Grey Flannel as their own uniform evaluator as early as 1996. Sotheby’s VP, Marsha Malinowski, was the in-house representative in charge of the Halper sale, so we asked her to explain Grey Flannel’s letter to their customer who spent $26,450 on Lot 38. Malinowski did not respond to email and several telephone inquiries to her office in New York City. The Sotheby’s Halper catalogue indicates that the auction house guarantees the “provenance of memorabilia of historical interest, the value of which derives solely from its historical significance.” Sotheby’s also asserts that, “within five years from the date of the sale of a purchased lot,” the original purchaser can return an item of questionable authenticity. Over a decade after the Halper sale in 1999, the prospects of recovery from Sotheby’s for the buyer of the bogus jersey don’t look promising. Sotheby’s is no stranger to allegations of defrauding customers. At the time of the Halper Auction in 1999, Marsha Malinowski was an “Acting Division Head” working under President and CEO Diana Brooks and Chairman Alfred Taubman. In 2002, both Brooks and Taubman were convicted by a federal judge for what the New York Times described as, “leading a six-year price-fixing scheme with rival Christie’s that swindled auction house customers out of more than $100 million.” It is not known if the investigation at that time uncovered any price-fixing in the Halper auction, which broke all records for the sale of baseball memorabilia. For now, he’s in the hole 26-grand with a worthless piece of flannel on his hands. He’s hoping one of the players in this mess will step up to the plate and do the right thing. 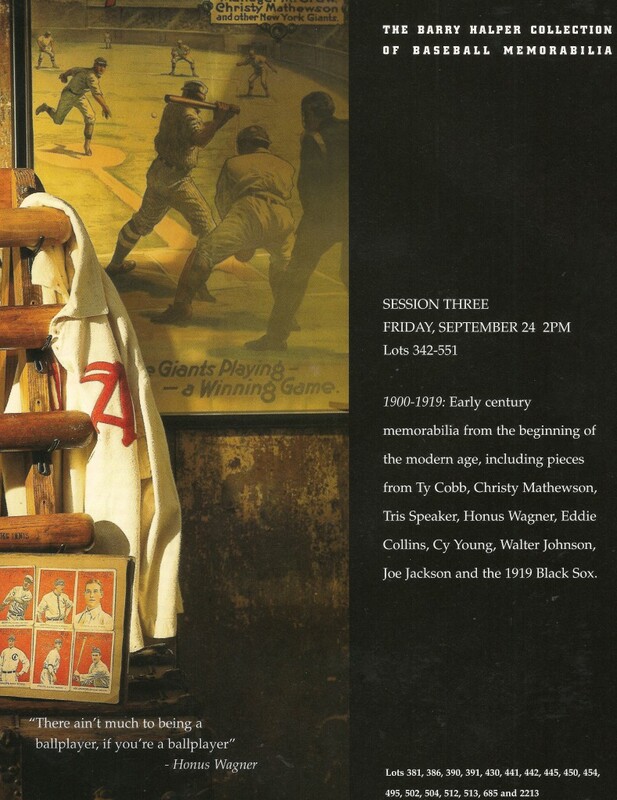 Barry Halper's counterfeit Jimmy Collins jersey was featured prominently in the 1999 Sotheby's catalogue. I really hope this collector gets his money back. As shown on this article and other Halper related articles, it seems like research by the auction houses and authenticators were not done, they rubber stamped the items as real because they came from Halper’s collection with no questions asked, as Halper’s reputation and stories seemed real. Once the pieces were put together, mainly that Halper had different stories of how he obtained items, did it seem fishy. When real research was done on the jerseys and autographs outside of the great stories has the truth come out. Best of luck to the collector with the Collins jersey. He bought from sources who claimed they were experts when it was sold, but then deny it when he wants his money back. I just got a copy of the amazing huge 3-volume Sotheby’s catalogue for the Halper collection. It’s so interesting to look up the items mentioned by Hauls of Shame. Sotheby’s absolutely guaranteed the authenticity of everything in the catalogue. I think the very number of exceedingly rare things included would have caused me to be skeptical as to their authenticity. Experts in “fine arts” spend most of their lives studying art of specific periods, genres, media, individual artists and even individual works of art. And for experts on baseball uniforms we have, what, TWO, and one of them is a little shaky? I’d be curious to know the level of knowledge, experience or training that major auction firms require when hiring their in-house “expert” on sports artifacts, and how that compares to their standards for in-house experts on Italian Renaissance art, to be able to judge and distinguish between Quattrocento or High Renaissance works; or differences in mannerist from baroque period art, or 19th century French impressionism versus post-impressionism? I’m more than willing to bet that the auction firms don’t have the same exacting standards for someone judging baseball uniforms. And that’s precisely why forgery of sports or other popular culture memorabilia is so tempting. True, a baseball uniform will never bring the price at auction of a Renoir (not yet anyway), but it also has had nowhere near the level of scrutiny. And up until now the pickings have been easy for the forgers and those who aid and abet forgery. My best advice to any collector of pop culture memorabilia is simple: research, study and become your own expert. And in the digital world, it is not nearly as difficult as before. Yes, you should still seek out the opinion of an professional, but you’ll sleep better at night if you also know the field well. After all its your money going into your collection, and not that of the experts or the auction houses. YOU ARE TO BE COMMENDED MOST HIGHLY FOR DOING A MARVELOUS SERVICE IN ILLUMINATING ALL OF THESE INDIVIDUAL AND GROUP ITEMS OF WHICH MUCH IS WORTHY OF DETAILED REVIEW. Another piece of garbage sold for a fortune ,when it was worth $ 49.99 in any sports store.Where is it all going to end,when they finall y shut the doors on the HOF for all the forged items they have or when someone else ends up spending a fortune for a useless piece of garbage and the ramification turns out nasty ???????? The man was the Bernie Madoff of the memorabilia business. The whole Halper story is worthy of coverage on 20/20 or Dateline or one of the other network news magazines. They’ll track down these Sotheby’s officials & Grey Flannel “experts” and get them on-the-record. Someone needs to be held responsible. Please let me know if you’re looking for a writer for your site. You have some really good articles and I believe I would be a good asset. If you ever want to take some of the load off, I’d absolutely love to write some content for your blog in exchange for a link back to mine. Please blast me an email if interested. Regards!